Admitted to Maudsley Hospital 7 February 1979 - 21 April 1980. 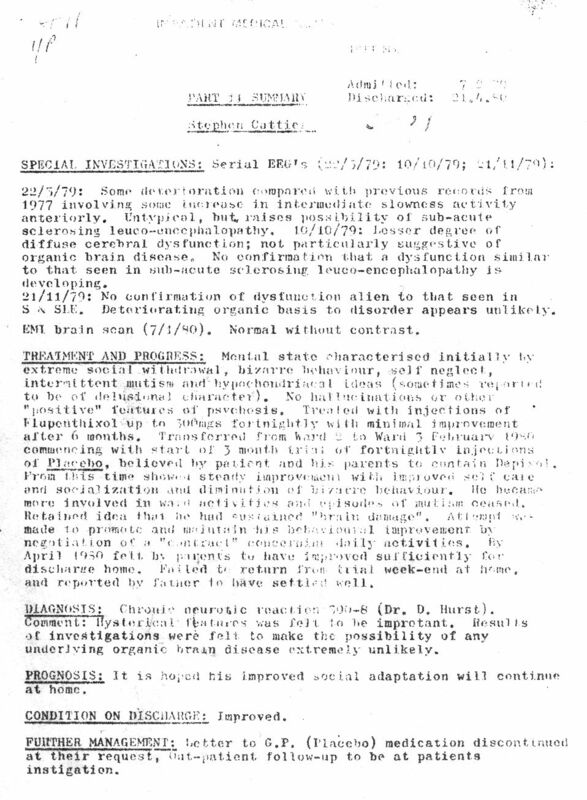 Was on a section of the mental health act for one year from March '79 receiving Depixol depot injections for refusing medication but then a placebo for some weeks before discharge - see photocopy of doctor's report below. I deduced I was having a placebo of Depixol and not the real thing for some weeks before discharge after having it for real for about ten months, because the side-effect of the approximately once every three day feeling of terrible fear altered slightly. However, I experienced it at a still an awful intensity up to August 1980 about three weeks before the major relapse in September that was caused by me over-speaking. I was also still on Disipal (orphenadrine) up to August (it removes the antipsychotic drug's side-effects). The relapse immediately put me to bed in a darkened room for six months and with all senses hypersensitive and unable to, walk, speak and communicate. Thank goodness I did not have to endure that fearful feeling and the relapse simultaneously otherwise I do not think I would have endured.